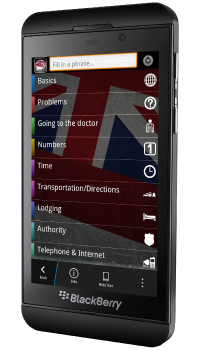 We’ve released Talk Dutch Phrasebooks for BlackBerry® 10 and PlayBook™. With over 290 useful phrases and words, you’ll always have the right sentences at hand! Whether you want to order food or ask for directions, with Talk Dutch Phrasebooks you can in spoken fluent Dutch. Available in English, French, German, Japanese, Mandarin & Cantonese. 290+ useful phrases spoken in Dutch. Written sentences in source language & Dutch. Talk Dutch Phrasebooks are compatible with BlackBerry® 10 & PlayBook™.